Are You Exercising Within Your Target Heart Rate Zone? 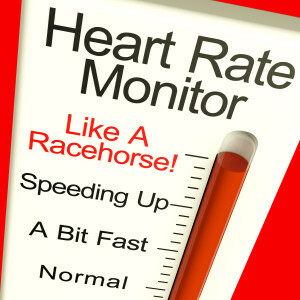 To determine whether you are exercising within your target heart rate zone, you must monitor your heart rate. This can be done by a couple of methods. The easiest way is to invest in a heart rate monitor. Such a device consists of a strap that you place around your mid-section, and a wrist watch. The two communicate with one another and your heart rate is displayed on the wristband. This is by far the most convenient and accurate way to monitor your heart rate. The second method is the old fashioned way, which requires you to stop exercising briefly to take your pulse. You can take your pulse at the neck, wrist, or chest. Most professionals recommend the wrist. You can feel the radial pulse on the artery of the wrist – in line with the thumb. Place the tips of the index and middle fingers over the artery and press lightly. Do not use the thumb since the thumb has a pulse of its own. Take a full 60-second count of the heartbeats, or take a 30 second count and multiply by 2. To get your heart rate even more quickly than 30 seconds, I like to take a 6 second count and multiply by 10, or simply put a “0” on the end of the number I counted. For example, if I count 14 beats in 6 seconds, then my heart rate is 140 bpm. Regardless of the method you choose to monitor your heart rate, be sure you understand how to determine your target heart rate, and adjust your level of exercise intensity, accordingly, in order to stay within your target heart rate zone.